Red velvet, cheesecake, white chocolate, how can these not be amazing! Well, I have to say, while these bars came out pretty delicious, this recipe is not perfect. I think I went a little overboard with the amount of red velvet. The next time I will definitely limit the amount of swirl so that the flavor of the cheesecake comes through a little more. This recipe does take a little prep, but it is well worth it in the end. Trust me! * I place foil on the bottom of my backing dish with enough to hang over the edges of the pan so that the bars can be easily lifted out. Beat sugar and cream cheese until smooth. Split vanilla bean in half and scrape out seeds. Add to mixture along with the eggs and sour cream. Beat until combined. Add melted white chocolate and mix until smooth. Pour cheesecake batter on top of crust. Beat softened butter, oil, buttermilk, egg, vinegar, vanilla, and red food coloring until just combined. It is ok if the butter is not fully combined. Everything will come together later. I never measure the food coloring. I just add a couple squirts of AmeriColor super red until batter is bright red. Sift flour, sugar, baking soda, and cocoa powder. Add to wet ingredients and beat until smooth. 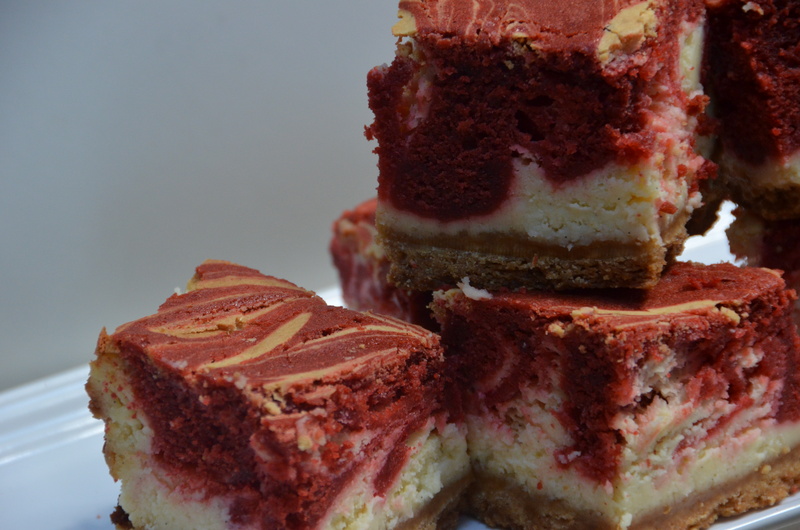 Spoon red velvet batter on top of cheesecake and use a knife to swirl. Bake at 325 for 1 hour 30 min. Let cool in pan for about 30 minutes. Remove bars and let cool completely. Transfer to fridge so that they can set. They taste the best the next day when all the flavors have time to come together. * I purchase my vanilla beans from Beanilla.